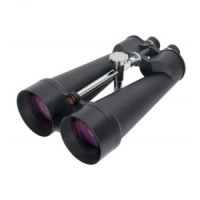 Celestrons SkyMaster Series of large aperture binoculars are a phenomenal value for high performance binoculars ideal for astronomical viewing or for terrestrial (land) use - especially over long distances. Each SkyMaster model features high quality BAK-4 prisms and multi-coated optics for enhanced contrast. Celestron has designed and engineered the larger SkyMaster models to meet the special demands of extended astronomical or terrestrial viewing sessions. The 15x70 version is one of the most popular models in the series. It offers serious large aperture light gathering in an affordable and reasonably lightweight configuration. The best available binocular for astronomical use that is light enough for hand holding, and still having a larger aperture. Easily tripod mounted for astro or terrestrial use. As a terrestrial binocular, it excels in low light. For birding at dawn or dusk, and for wader or gull roosts, this binocular removes the need for a spotting scope. The magnification is high enough to resolve detail and for species recognition in poor light, whilst retaining a bright image. An exit pupil of 4.67mm is ideal for this purpose. 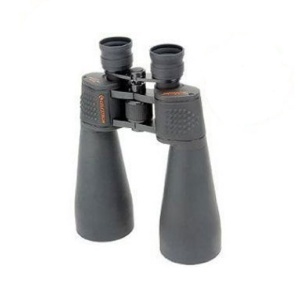 This binocular is lightweight enough to hand hold for this purpose, or can be mounted on any popular birding tripod. Celestron’s SkyMaster Series of large aperture binoculars are a phenomenal value for high performance binoculars ideal for astronomical viewing or for terrestrial (land) use - especially over long distances.